Waiting (Japan), Waiting (Sweden), Waiting (Canada). Another same catalog # UK release Waiting exists with Side Y and Side Z printed on labels. 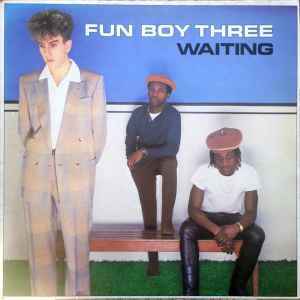 Main artist is written as 'Fun Boy Three' on the sleeve and 'The Fun Boy Three' on the labels. Recorded at Wessex Studios London Oct-Dec 1982. ℗ 1983 Chrysalis Records Ltd. © 1983 Chrysalis Records Ltd.
First published in the UK 1983 by Chrysalis Records Ltd.
℗ 1983 Chrysalis Records Ltd. Track A2 ℗ 1982 Chrysalis Records Ltd.
© 1983 Chrysalis Records Ltd.
Track A1 published by The Big Three Music Ltd. Tracks A2 to B1, B3 to B5 published by Plangent Visions Music Ltd.
Track B2 published by Chappell Music Ltd./Plangent Visions Music Ltd. Thanks To: Rick Rogers, Jeanette Powell, Peter Barnes, David Jensen & Mike Hawkes. Matrix / Runout (Side A runouts): CH R 1417 A//1▽420 U 1 1 1 2 ƱTOPIA. Matrix / Runout (Side B runouts): CHR 1417 B//1▽420 U 1 1 1 ƱTOPIA.